On a year-long trip, we found scythes in common use throughout Europe—from Turkey to France to Scandinavia. In modern Switzerland, Alpine farmers regularly scythe hay on slopes that are too steep for any machinery. Grazing cattle would lead to erosion. And if the grass is allowed to grow, winter snow clings to the long, dry blades until great weights accumulate, causing avalanches and loss of precious soil. The Alpine farmers are very practical workers, so I was particularly interested in their technique ' for mowing. Watching a man and his teenage sons scything a very steep field gave me the impres-'«on of a functional ballet. The effort exerted was great, yet light and rhythmic all at once. About every 15 minutes work halted. The blade» were quickly honed with a whetstone kept in a water-filled scabbard hung from each man's belt. 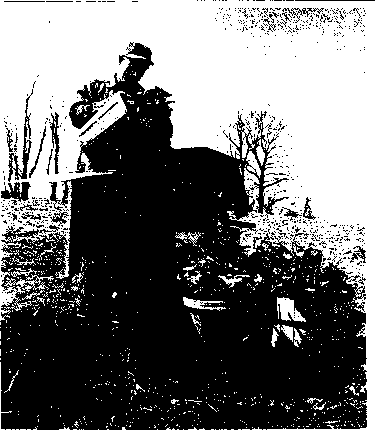 With razor-sharp blades, mowing resumed until a small field, perhaps an acre, was cut. One day our Swiss host informed mc- that the grass around his cheese-making hut was of sufficient growth for mowing into a small amount of fodder. 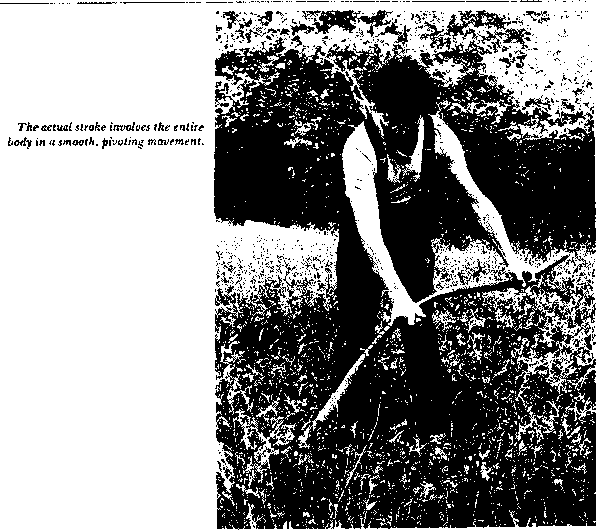 Of course, I was quite anxious to try scything. First he demonstrated his sharpening procedure. The edge of the blade must be so thin that it deflects when pressed against one's thumbnail. Lightweight grass-cutting blades come this way new. But after repeated honings, the thin edge section wears away, leaving a cutting edge too thick for razor-edge sharpening. Rethinning is done by pounding the blade with a hammer over a small stake anvil driven into a lc>g. When the blade passes the thumbnail test, it is ready for honing. For the proper mowing technique, legs are set rather apart, knees are bent a little, and the body cants forward at a slight angle for balance. To begin a stroke, your trunk is twisted quite far to the right. The scythe is held so that the tang, the shank connecting the blade and handle, is just above the ground, at cutting depth. The blade tip is angled slightly upwards, but not much. The position of the tang regulates the cut. The slightly lifted tip is to help avoid hitting obstructions during the stroke. Finally, the blade is aimed so that it will cut a very thin swath with each stroke. The scythe is not a hacking weed chopper, but a fine cutting tool. In use, the blade actually slices along whatever is being cut. Each pass mows only a few inches in depth, perhaps six to ten inches, depending on the blade length. The actual stroke involves using your entire body in a smooth, pivoting movement. Beginning at the right, swing in a full arc until your shoulders arc turned all the way left. (This long, thin stroke actually cuts more grass than a short, broad hacking movement.) 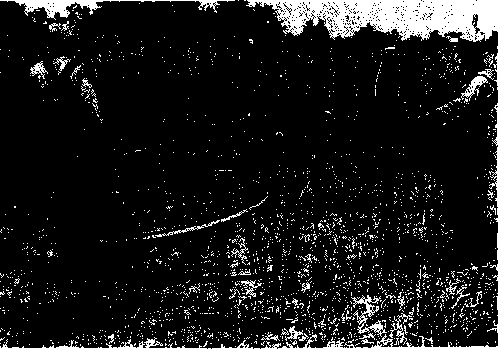 Then take a short step forward as the scythe is returned to the beginning position. Several types of scythe blades and snaths (handles) are currently available in America. The standard blade, 80 inches long and made of fairly heavy steel, is suitable for cutting weeds and small grains. A shorter, even stouter blade is sold for clearing brush and briars. The technique for using these scythes is the same as for mowing grass, but with extra vigor. These blades are generally not pounded thin or sharpened to such a high degree as grass blades. But they must be kept quite sharp to be effective. Standard blades are generally sharpened with a mill file or on a hand-turned grindstone. Work mainly on the bottom side of the edge. Many a frustrated mower has a blade sharpened on the upper edge. This creates a downward-slanting bevel that tends to run the scythe into the ground as it cuts. Always sharpen standard blades on the lower side first, then gently remove any wire edge that may form on the upper side. It is a good idea to finish up by honing with a hand stone. Recently, thiri, lightweight grass blades have been imported to this country. These blades are excellent for fine mowing work, but they are not suitable for cutting tough weeds. They are delicate; the fine edge is quickly dulled or nicked if run into the ground, a stone, or hidden debris. Two styles of snaths, or handles, are on the market. The standard snath is made of bent ash and is quite heavy. These are rugged and suitable for use with standard and brush blades. Also available is a bent aluminum snath, which works quite well with the superlight grass blade. But aluminum snaths are too tight for the more rugged work of cutting grain, coarse weeds, or briars. For such tasks, the extra weight of the ush snath creates a momentum that helps in mowing. Wooden snaths should be cleaned and treated, once or twice a year, with a mixture of two parts tinseed oil to one part turpentine. Some older hardware stores still carry scythes, especially in country districts. You might have to ask, as the last one ever ordered may be in the back storeroom. The grain cradle is an improved scythe with a set of wooden tines above the blade that catch the wheat (or other grains) as the blade severs it on the forward swing. Mastering the art of the scythe and grain cradle takes coordination and practice. For a right-handed stroke, the left foot is placed one stride forward and the first stroke is taken with the blade nearly parallel to the ground. The trick is to keep the grain stalks laying all one way during the next four strokes. Before each consecutive stroke, the right foot comes forward one-quarter stride. After the fourth stride, the wheat on the tines is slid off into a neat pile at the farther reach of the cradle's forward swing, ready to be tied into a bundle. with good reason; it takes practice and skill to master a task. Like an old pair of shoes, the tool conforms to the technique its master employs— becomes molded to his style and uncomfortable in the hands of another. 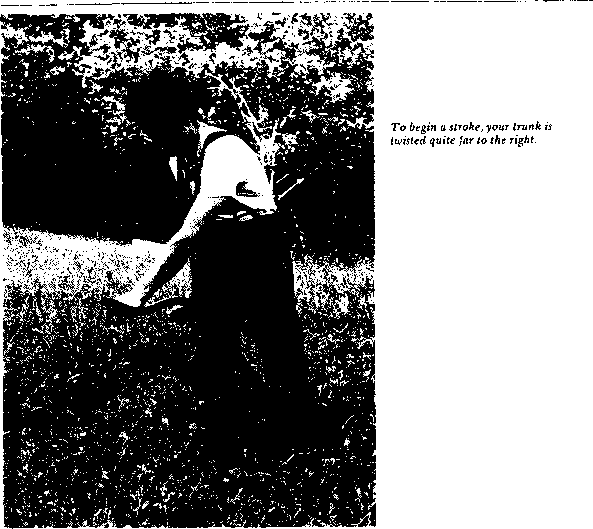 The skill and intimacy in the relationship between man and tool are reflected in the following article by Steve Taylor about mowing with a scythe and the rare people who have the skill to use it right.